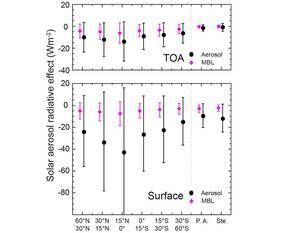 The difference gives the solar aerosol radiative effect ( Δ F, in the solar range). Δ F < 0 at the TOA indicates an increase of escaping irradiance, i. e., a solar radiative cooling of the atmospheric column caused by aerosols. 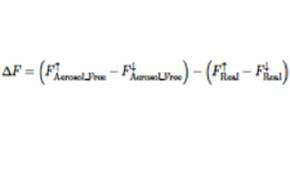 At the surface Δ F < 0 means a net loss of solar radiation (i.e., cooling) of the atmosphere. To our knowledge, Wagner et al. presented the first radiative-transfer calculations that directly included height-resolved aerosol information derived from lidar. Single-scattering albedo and asymmetry parameter were inverted using the derived optical properties from 3+2 lidar measurements during INDOEX [Müller et al., 1999]. Recently, we perform radiative-transfer calculations with the UVSPEC program [Kylling, 1992] of the libRadtran library version 1.6 (link) to calculate the broadband solar downward and upward irradiances at the surface and TOA to derive the solar aerosol radiative effect [Mayer and Kylling, 2005]. The libRadtran library includes the discrete ordinate solver DISORT version 2.0 [Stamnes et al., 1988] and the spectral integration by the correlated-k approximation [Kato et al., 1999]. DISORT has been applied with sixteen streams with respect to the built-in bidirectional reflectance distribution function (BRDF) [Cox and Munk,1954] for the surface albedo. Solar zenith angles were determined from position and time [Blanco-Muriel et al., 2001]. Particle and cloud-free atmospheric conditions are described with standard atmospheres implemented in libRadtran [Anderson et al., 1986] regarding trace gases and radiosonde or GDAS1 profiles of pressure, temperature, and relative humidity. Vertically resolved aerosol conditions were included in terms of the lidar-derived extinction profiles. Single scattering albedo (SSA) and asymmetry parameter (g) have been taken from the literature [Dubovik et al., 2002, Heinold et al., 2011; Müller et al., 2011]. At TROPOS we compare the results of the radiative-transfer simulations with Meteosat Second Generation and coincident pyranometer measurements. 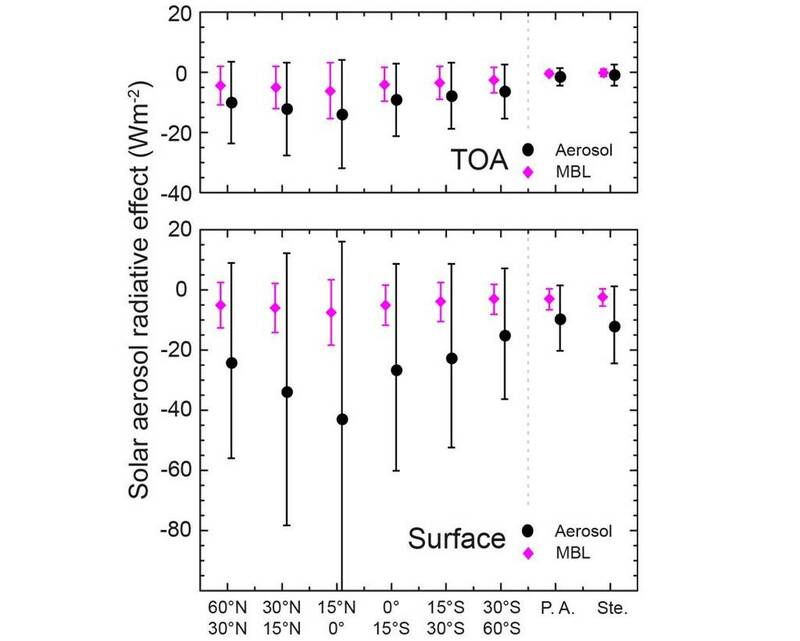 Fig 1: Mean solar aerosol radiative effect at the top of atmosphere (TOA, top) and surface (bottom) for different latitudinal belts as determined from libRadtran simulations on the basis of lidar observations performed during three transatlantic cruises of Polarstern in 2009 and 2010 as input for the vertical aerosol distribution. Black filled circles show simulation results including free-tropospheric and boundary-layer aerosol. Magenta diamonds show results of simulations with only boundary–layer aerosol. During the Polarstern cruise ANT-XXVI/4 extended lofted aerosol layers were observed off the west coast of northern Africa from 8–21N, 23W(over 1400 km) between 30April 2010 and 5May 2010. The analyzed lidar measurement showed mean extinction–related Angström exponents of 0.8. The particle linear depolarization ratio was, on average, 21-22% which indicates the presence of non–spherical dust particles. Nevertheless, the layer mean Angström exponent was higher than the typical value for pure dust (of around 0), and the 355-nm particle linear depolarization ratio was smaller than the pure–dust values of >26% [Freudenthaler et al., 2009; Groß et al., 2011 b]. Mean lidar ratios of 59–61 sr at 355nm were in the range of pure–dust–related lidar ratios of 48-70 sr and mixed-dust-related lidar ratios of 57-98 sr [Groß et al., 2011 b]. After Tesche et al. , the fractions of dust and smoke were determined on the basis of the particle linear depolarization ratio to be 0.7 and 0.3. Three different scenarios were assumed in the radiative-transfer simulations. Calculations were performed for lofted layers of pure dust or pure smoke in the presence of a pure marine MBL (cases 1 and 2). In addition, for case 3 the mixing ratio of smoke and dust in the free troposphere was set to 30%:70% as derived with lidar. Furthermore, a mixed MBL with a dust and marine particle fraction of each 50% was assumed, reflecting the observed comparably high AOT of the MBL and the significantly enhanced depolarization at the top of the MBL [Groß et al., 2011 a; Kanitz et al., 2013 a]. Figure 2 shows the observed irradiance (black line) at the surface on 1May 2010 from 6:00 to 18:00UTC. Simplified calculations for non-mixed aerosol layers (cases 1 and 2, blue and orange lines) are presented, too. 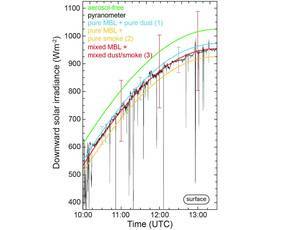 In between is the modeled irradiance that includes a MBL with a fraction of 50% dust and a lofted layer with a smoke fraction of 30% (case 3, red line) as suggested from the lidar analysis. The modeled irradiance for an aerosol-free atmosphere (green) is highest. The simulation of a mixed lofted layer that includes 30% smoke (red, case 3) agrees well with the measured incident irradiance. 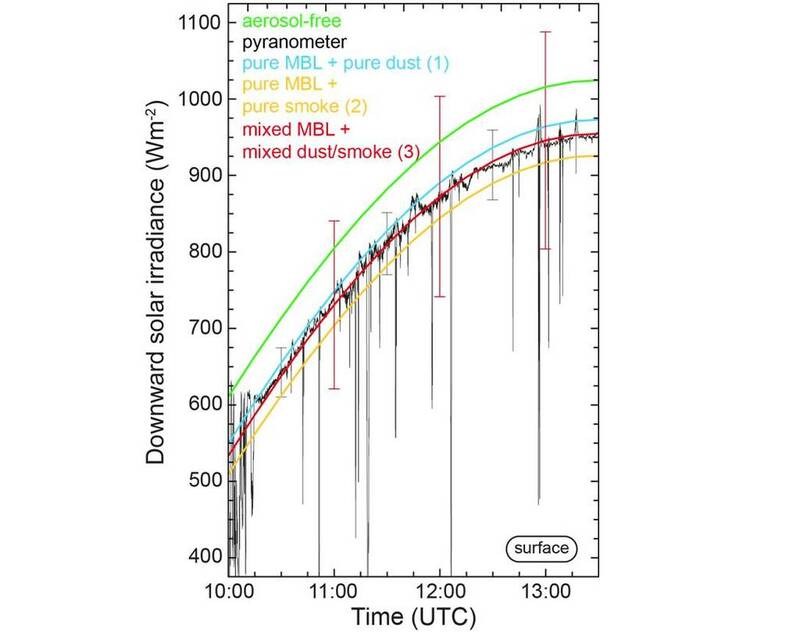 In the case of a pure dust layer the modeled irradiance is slightly higher than the measured irradiance (case 1, underestimated absorption), whereas it is too low when only a pure smoke layer is considered (case 2, overestimated absorption). In the framework of the SAMUM campaign Otto et al. performed dust-particle-shape-dependent (approximations by spheroids) radiative-transfer calculations and used lidar measurements to evaluate the results with profiles of backscatter and extinction coefficients. Heinold et al. modeled dust and biomass-burning smoke emissions in North Africa to determine their radiative effect during long.range transport. The modeled properties of the mixture of dust and biomass-burning smoke were validated with lidar measurements.